Thanksgiving is hands down my favorite holiday. I love it so much that we not only spend the big day with our family, we also host a Thanksgiving party for our friends the weekend before the real deal so we can have that yummy meal two times each year. After testing a few Thanksgiving stories in the EatingWell Test Kitchen and hosting my own pre-Thanksgiving dinners, I realized that there are three tools that make getting the feast on the table a whole lot easier. Are they in your kitchen? 1. Roasting Pan—While roasting countless turkeys in the EatingWell Test Kitchen, we also tested several different types of roasting pans. We loved the look of shiny, stainless-steel roasters and loved the lower price of thinner-gauged metal pans, but our favorite was the Calphalon Unison Nonstick Roaster (about $150, williams-sonoma.com). 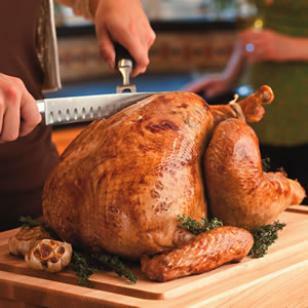 The dark-colored, heavy-gauge, infused-anodized aluminum conducts heat more evenly and yields a perfectly browned bird with luscious pan drippings. 2. Remote Digital Thermometer—Do yourself a favor and ignore those pop-up thermometers that come pre-installed in most conventional turkeys: the only thing they’re good for is yielding a dry, overcooked turkey. Yuck. Once you try a remote digital thermometer, you’ll never use another one when you’re roasting a big hunk of meat. More convenient and more precise than a standard instant-read thermometer, a remote digital thermometer constantly monitors the internal temperature of roasting meat—while the oven door is closed—and sounds an alarm when it reaches the desired temperature. One word of caution: The sensor probes can be easily damaged, so it’s important to follow the manufacturer’s recommendations for cleaning and storage. Polder Dual Sensor Thermometer (about $25) can be purchased at amazon.com. 3. Fat Separator—Once the turkey is done, it’s time to make the gravy. When making pan gravy you want to use the flavorful pan drippings, minus the fat. The easiest way to separate the two is with a fat separator specially designed for this task. Just pour the pan drippings into the measuring-cup-like tool, let the fat rise to the top, then pour the juices from the spout as the fat stays behind. We like the Oxo Good Grips 2-cup Fat Separator (about $11), which comes complete with a strainer top and a rubber stopper to help keep the fat out of the pour spout. Look for it at Cooking.com.